Quirky Jessi: Models Give Negative Self-Image---Is This Image Better? 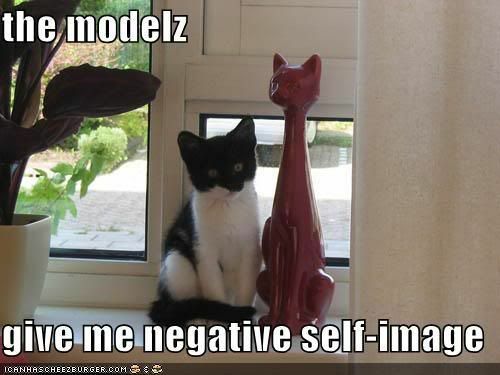 Models Give Negative Self-Image---Is This Image Better? I recently noticed that some of the images I'd used in a pro-ana/mia post had been deleted. I'm guessing what little of the bodies were left...showed too much. It was kind of irritating, but I understand regardless, I suppose. And so, in light of such a serious subject, I can't help but post the above lol-cat. The words are true, although the cats make it seem cute. Is that a more appropriate image to use?